PVL TECHNOLOGIES, INC. is a global supplier of geotechnical test equipment and submersible vibracoring sediment collection equipment. 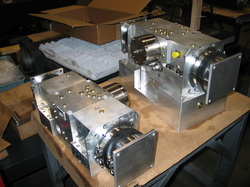 We specialize in design and manufacture of advanced equipment for sediment sampling (vibracores and accessories) and geotechnical centrifuge modeling (including single- and multi-axis servo-hydraulic shakers, cone penetrometers, laminar and static modeling containers, consolidation equipment, actuator and load frames for in-flight loading, split box model containers and in-flight robots). In addition to the products described within this site, please note that we are always ready and eager to 'push the envelope' and develop custom equipment to suit our customers' specific requirements.